There aren't that many foods I remember my dad having to be cajoled to eat. My sister? Yes. She went through a period when she didn't like tacos. I mean, come on. Tacos? Eventually she relented and qualified it by saying she just didn't like my mom's tacos, as though that were somehow better. Or even remotely reasonable. Oh little sisters. But my dad agrees only to eat brussels sprouts for Thanksgiving, and then, probably only two at most. The problem couldn't be that they taste like cabbage, coming from the same family of vegetables and all, because he loves his mom's stuffed cabbage rolls. I think the problem might be in the preparation. Or more specifically, in the boiling. There are few foods that respond to boiling, and it turns out, the brussels sprout is not one of them. They become mushy on the inside, waterlogged, and just kind of not-good. (Although I'll eat them any time in any incarnation, boiled or whatever. But this way is better). What should you do? You could roast them, but for big holidays when the oven is being monopolized by more important fare (turkeys, pies, even sweet potatoes are, let's face it, more important), it would be nice to keep them on the stove top. Which is actually a wonderful way to prepare them, and takes only minutes. Two to three minutes on each side, in fact, because as experience teaches, brussels sprouts do not benefit from mushiness. Unlike many of our American feasting foods, the brussels sprout doesn't actually come from the new world, but from Northern Europe. They were popular in, you guessed it, Belgium. All of this according to Aliza Green in her book Starting with Ingredients, which must have been a pretty behemoth undertaking. In the book, Green dedicates all of the 100 chapters to a different food or food group, providing information on history, use, buying and storing. Oh, and a handful or recipes for each. This one comes out of the cabbage chapter, while the balsamic syrup is written to be drizzled over mushrooms. And while we're on the subject, that balsamic syrup is some good stuff. As soon as I tasted it, still scalding on the wooden spoon, my mind started racing with all of the things I wanted to dribble it over. If you don't have access to an aged, syrupy and seriously expensive balsamic vinegar, this is your next best bet. Note: I've cut the recipe in half because I was cooking for only two of us. Feel free to double or triple for larger crowds. In a small saucepan, combine all of the ingredients for the syrup. Heat over medium heat, whisking to dissolve the sugar and honey into the vinegar. Bring the mixture to a boil, then reduce the heat to low and simmer for about ten minutes. Watch it closely, because this stuff will burn fast if it's over too high a heat. When the sauce is sufficiently reduced, a wooden spoon run along the bottom of the pan should leave a bit of the trail as it parts the vinegar. Remove from the heat and set aside. The syrup will continue to thicken as it cools. Trim the woody bottoms off the sprouts. Stand them on their newly flattened bottoms and cut in half top to bottom. Preheat some oil in a medium-sized saute pan over medium heat. Place the brussels sprouts halves cut side down and saute for about 3-4 minutes, until browned. Turn once, and brown on the other side for about 2 minutes. Drizzle with the balsamic syrup and serve. 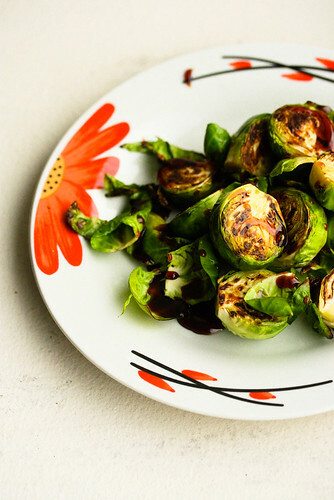 This is one of my favorite ways to eat brussels sprouts! Sayin' no to tacos?! Never... LOL! Brussels sprouts were my nemesis in the old days, so I can totally relate to your dad. However, I'm a big fan now, and those look delicious! Brussels sprouts take so well to sweet-tart preparations. I can already taste how good this one is. Yum! 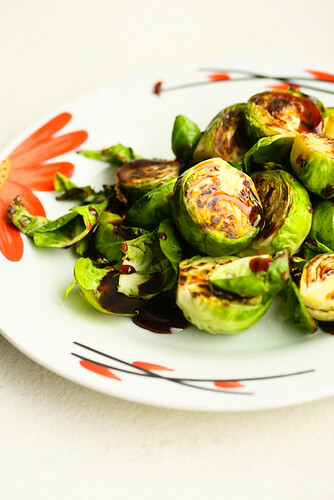 I 'm a great fan of Bruxel Sprouts, I can't wait to try them this way! Maybe I can get Hubby & son to eat them too! Thanx!! I also love putting balsamic vinegar on almost anything, so this is like a match made in heaven. I love everything that's caramelized! :-D They're so delish! I never like Brussels sprouts, either, until I had them cooked in a pan util all delicious and browned-like. Now I love them. And that balsamic syrup sounds fab.